Have you always wanted to visit Patagonia but felt intimidated because you are not an experienced hiker? If you try to look up easy hikes in Torres del Paine online, many people will tell you that you have to hike the W to “do it right”. The good news is, you can see plenty of Torres del Paine without hiking the circuit. I am not a good hiker. I have no interest in carrying a huge backpack and setting up a tent in the Patagonian wind. We almost didn’t go to Patagonia because I was scared that we wouldn’t be able to do anything if we weren’t hiking the circuit. We ended up having an amazing experience doing day hikes in Torres del Paine and staying right outside of the park. 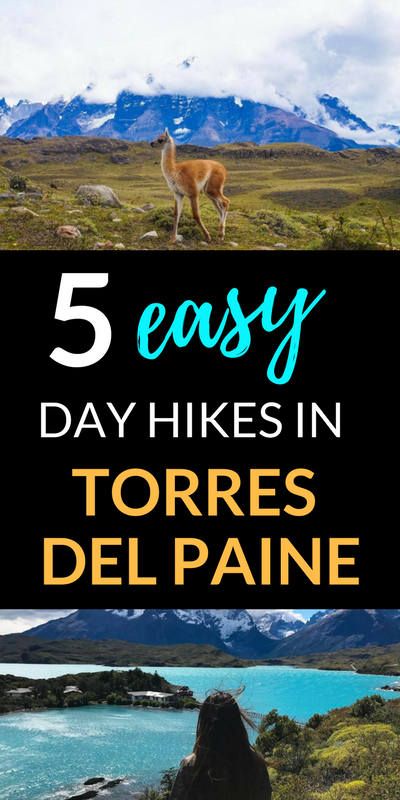 Here is a list of 5 easy day hikes in Torres del Paine for all the beginner hikers and those who just don’t have enough time in Patagonia for the full circuit. Laguna Azul is a deep teal blue lake located in the Eastern part of the Torres del Paine National Park. If you enter the park using the Laguna Amarga entrance, you will need to drive approximately 45 minutes to reach Laguna Azul. This particular location is off the beaten path because the tour buses who visit the park on a day tour usually do not come to the Eastern part. As you drive through the park, the road becomes narrow and curvy. You will start seeing more and more guanacos until you reach Laguna Azul where hundreds of them are casually gazing by the lake. With the lake in the foreground, the views of the Towers are breathtaking. 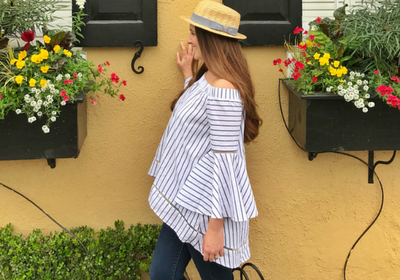 Laguna Azul was my favorite spot in the entire park…but let’s keep it a secret! If you want to go on a short hike you can park your car near the lake and follow the trail to Sierra Masle. This short hike is about an hour long to reach a massive rock. The view at the end of the trail is amazing! The hike to Mirador Condor is of medium difficulty. Not because of the terrain, though there is some elevation, but mostly because of the very strong winds you will encounter at the top. 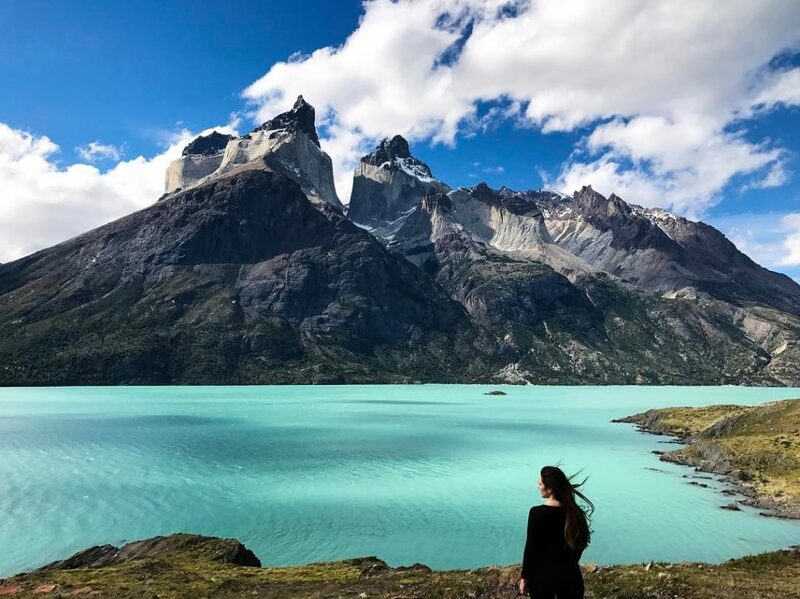 The views of the teal glacial lakes are absolutely breathtaking and this hike is definitely worth it. As you drive past Pehoe Lake, park at Pehoe Campsite and walk towards the back of the campsite for the start of the hike. Waste high grass can make the entrance of the path a bit tricky to locate. The path will quickly get steeper and rockier as the wind picks up. The panoramic views of the lake will get better and better as you climb up the path. However, if you are a bit short on time (or you’re getting tired of the steep path, it happens to the best of us!) you can take some fantastic pictures after hiking about 20 minutes up the path then make your way down. We got all the way up to the top where the wind almost blew me off the mountain… I had to hide behind the giant rock. It was strong AF. Matt climbed up the rocks all the way to the top (he’s braver than I am) but his iPhone almost flew off his hands so he quickly came back down. We certainly felt like condors at the top of the miradors though we were moving much less graciously on our way down the path. 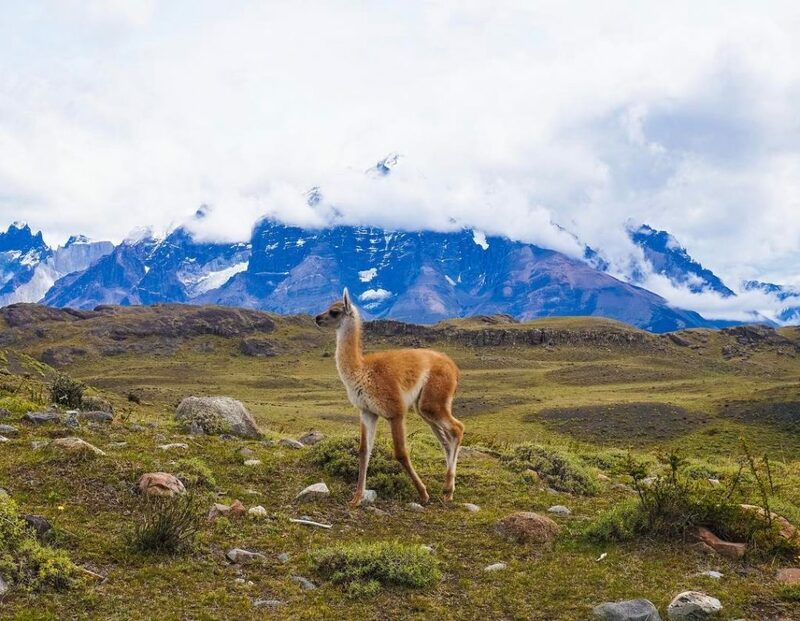 You won’t find the “Fauna Trail” on any maps of Torres del Paine National Park. This secret trail starts from a National Park entrance (Porteria Lago Sarmiento) and ends in another (Porteria Laguna Amarga) but you won’t really be missing out on anything by hiking half of it and tracing your steps back if you have your own vehicle to return to. The Fauna trail is home to herds of guanacos. You will encounter dozens of them on this trail and with the Paine Massif as a background it is heaven for photographers. 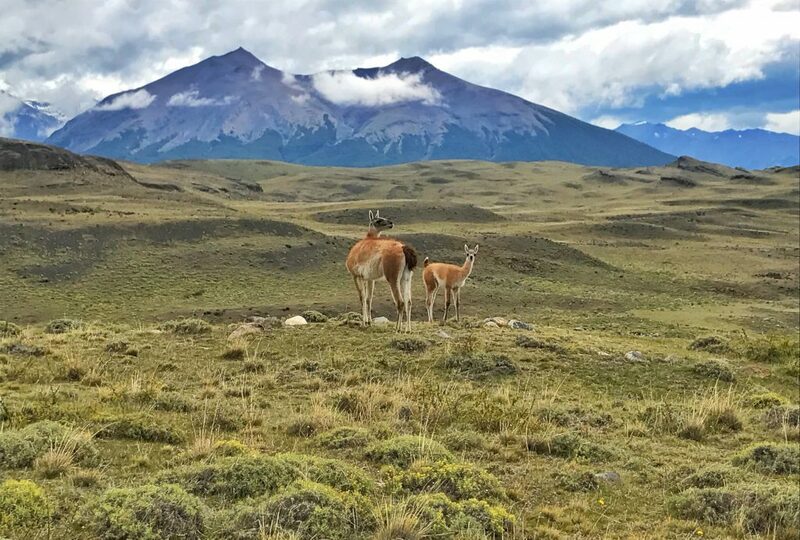 The guanacos are not shy and they will get pretty close to you (especially the little ones who are very curious!). We also saw a lot of condors fly in this area. If you are lucky, you might even run into a puma especially at dawn and dusk. Finally you can take a 45 minute detour to see the prehistoric cave paintings. After hiking up a ridge, you will see the small paintings on the wall of the cave estimated to be between 3000 and 8000 years old. It was a really cool thing to see but could be skipped if you are short on time. You will pretty much have the trail to yourself – we were in Patagonia during high season and we saw a total of 4 people during the 3 hour hike. It’s on this trail, totally alone except for a herd of guanacos grazing around us, that I really felt this overwhelming feeling of freedom and vastness that is unique to Patagonia. We were alone at the end of the world, and couldn’t be happier about it! 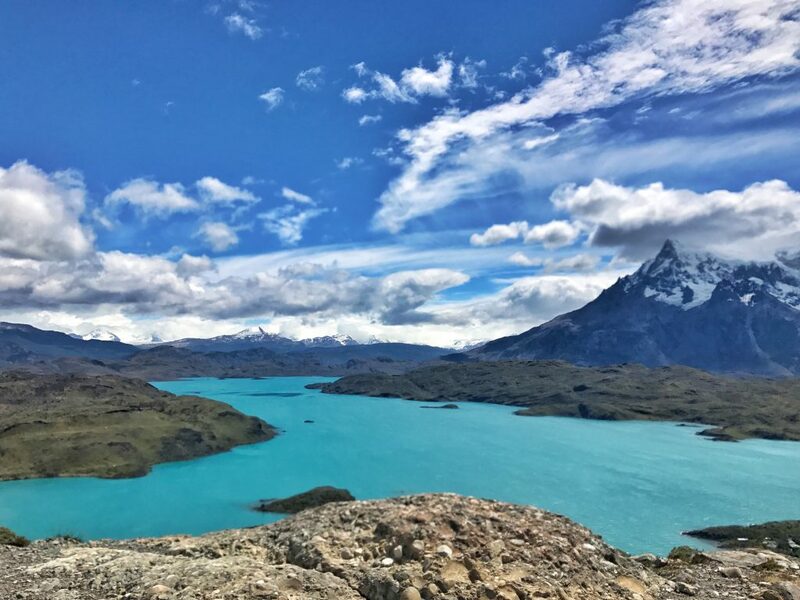 Starting at Guarderia Pudeto, this easy hike will take you to one of the most beautiful viewpoints in Torres del Paine National Park (and arguably in the entire world). After about a 10 minute walk you will come across Salto Grande, a rather small but very picturesque waterfall. Then, keep hiking the mostly flat trail for about 45 minutes. You will see many dead silvery trees on this trail as this area of the park was affected by a man made fire a few years back. 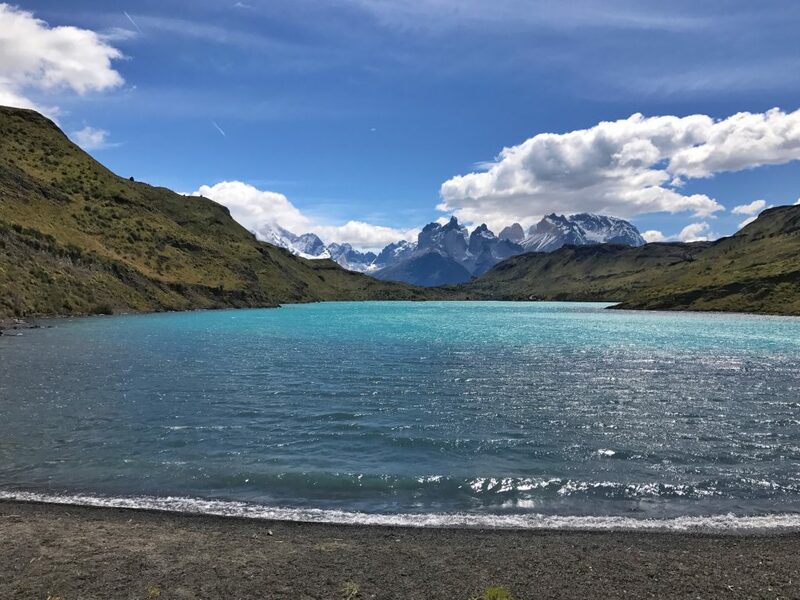 At the end of this easy half day hike, you will be rewarded by a jaw-dropping view of the turquoise Pehoe lake and the majestic Cuernos del Paine. Nothing can really prepare you for the landscape that appears in front of view when you turn that last corner at the end of the trail. Bring a picnic and find a spot to sit down and enjoy the view. One of my favorite easy hikes in the park! This is a short and easy walk to reach Lago Grey and get a glimpse of the Grey Glacier from afar. From the Grey entrance, you will cross the Pingo River on a wooden suspension bridge. Keep walking through a lenga and coigüe forest until you arrive at the dark sand beach. From there you will see the massive glacier in the distance. Walk to the end of the beach for about 20 minutes until you see a sign to the lookout point for a beautiful view of the milky blue lake and the glacier. 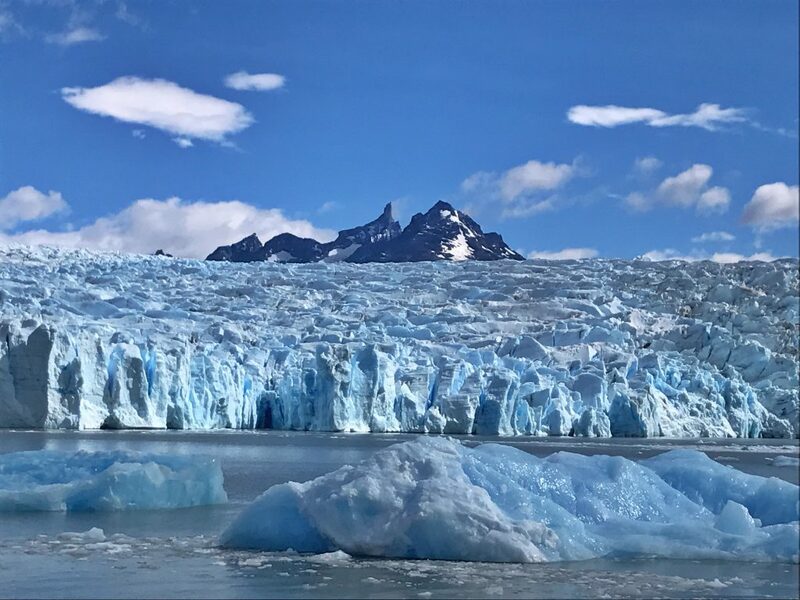 If you have more time, make sure to book a catamaran trip to the Glacier from Hotel Lago Grey. We were hesitating at first thinking it may not be worth the trip but we were SO glad we took the boat to the glacier. We also got extremely lucky that a cloudy and rainy day turned into sunny blues skies as soon as we arrived near the glacier. It was such a gorgeous day that the boat crew got on the roof to take some pictures! 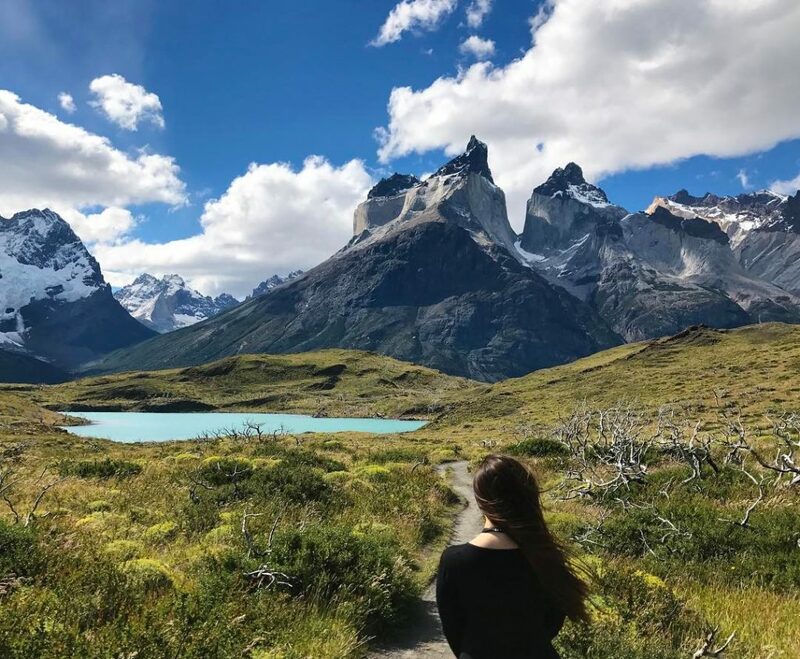 During our stay near Torres del Paine, we did not get to do the hike to the base of the Towers, which is significantly more challenging than the hikes described in this post. 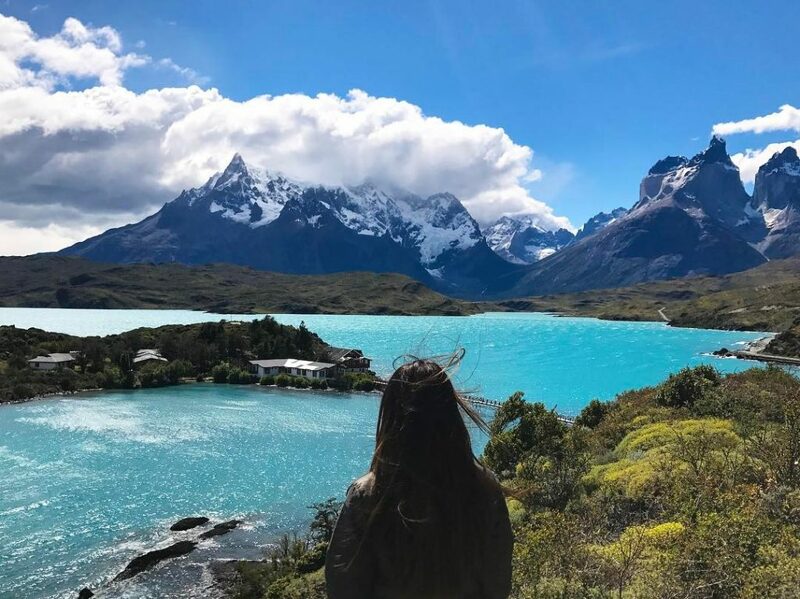 however, the view is a thousand times worth the effort: if you don’t believe me check out Exploring Kiwi’s post about hiking to the base of the Torres during winter time. and Jetfarer’s complete guide to the W trek. 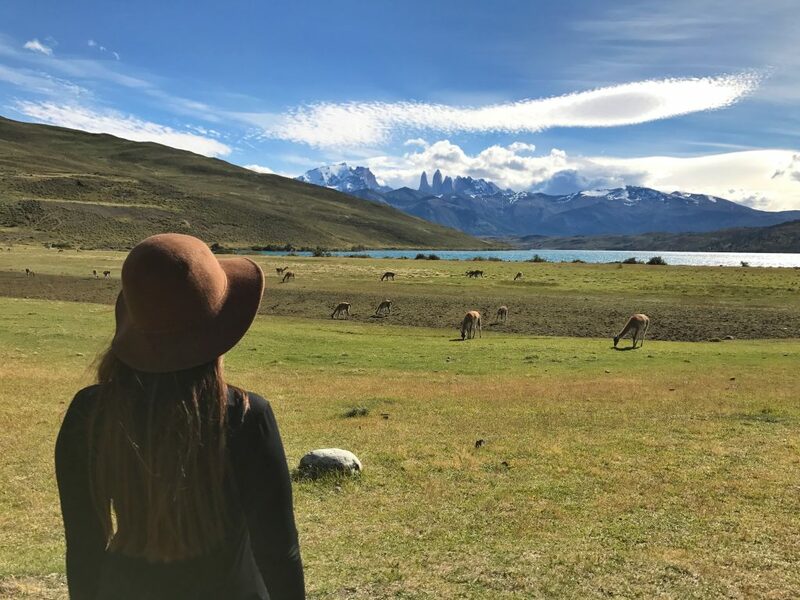 If you decide to stay in Puerto Natales and take a day trip to Torres del Paine with a tour group, check out A Side of Sunsets’ express itinerary for a taste of Patagonia in to days! 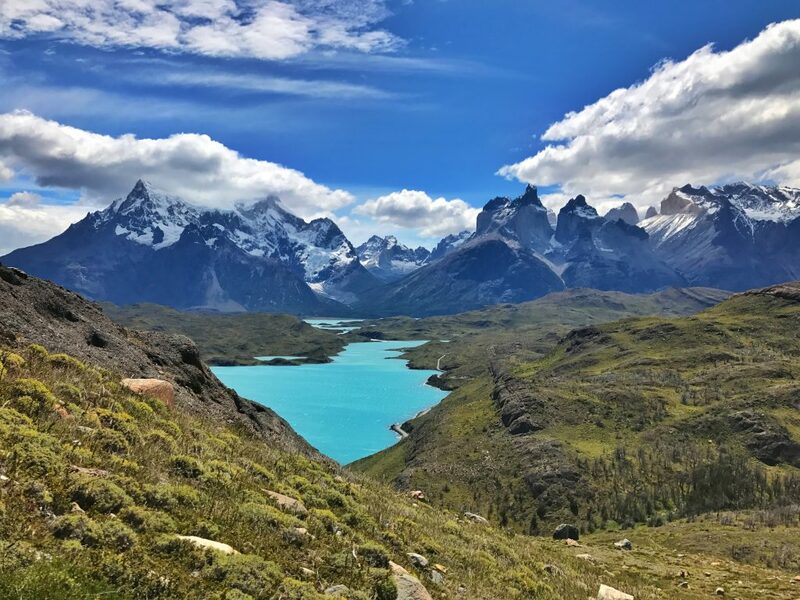 And finally, if you are having trouble deciding between Patagonia and Machu Pichu in Peru, check out Lauren’s post at The Down Lo for a great comparison of the two treks. OMG your pictures are so gorgeous that they made me cry….seriously! That glacier. Seeing Torres del Paine is something I am definitely doing in the next year so thank you for this. All of those hikes look worth while! A friend of mine visited Patagonia some weeks ago, mainly for whale watching but she also did some hiking. Will forward this article to her and asked if she visited any of these places. I’m still reluctant as far as Patagonia is concerned. I’m not a big hiking fan, either and don’t like windy/cold weather. However, your article and stunning photos make me want to go. Well, we shall see. I am definitely not a big hiker either! I was hesitant at first too. We did luck out when we went in December and got gorgeous clear weather pretty much the whole time so the massif view was amazing. But the winds are intense!! Omg such stunning view. They look so dreamy. I would so love to hike in these valleys. I had never heard of Pekoe Lake but definitely about Patagonia. I’ve been wanting to go since I was a kid. You’re convincing to take the next step! Gorgeous pictures and the writing simply mesmerizes the aesthetic taste for travel and exhilarating experience. Superb trip that you have taken us to. I’m in the midst of planning a trip to Chile and I’ve been worried about Patagonia because I’m not a strong hiker. This post has totally convinced me that there will be plenty to do at my speed! If you don’t mind me asking, where did you stay? In Puerto Natales or closer to the park? And did you rent a car or are these hikes accessible by public transit? I love hiking and these hikes seem so picturesque and worth doing, Julie. I especially loved the Mirador Condor hike. When’s the best time of the year to go hiking there? Thank you Julie. I appreciate the directions on how to find these trails, and your descriptions of the trails. We leave for Chile in 2 days!!! I have printed your post, and I am tucking it into my bag. We plan on hiking to the Towers, but I also wanted some shorter day hikes as we will have 4 full days to explore the park.